Dr. Calvin Stiller, chair of the board of directors of the Ontario Institute for Cancer Research (OICR), today announced that OICR is awarding $4 million over four years to the Centre for Imaging Technology Commercialization (CImTeC), which is hosted by Sunnybrook Research Institute in Toronto and Western University in London. The award will enable CImTeC to support researchers and small and medium-sized enterprises (SMEs) translate groundbreaking developments in medical imaging and digital pathology into new clinical tools for cancer diagnosis and treatment. 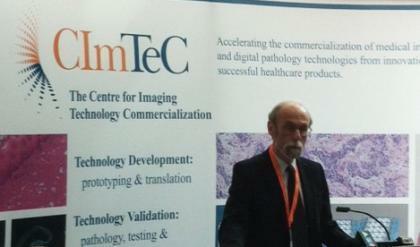 OICR is supporting CImTeC as one of the initiatives in their Imaging Translation Program, which is accelerating the development of imaging tools and techniques for earlier detection, diagnosis and treatment of cancer. The program, which is a key component of OICR's strategic plan, ensures discoveries in the laboratory are used in a clinical setting as quickly as possible. "We're building on Ontario's acknowledged strength in medical imaging," stated Dr. Aaron Fenster, CImTeC's Director and Acting CEO, and a Tier 1 Canada Research Chair. "CImTeC will help to capture these exciting innovations and deliver them to the patient bedside, where we will all see the value of this important work. These funds will help us make this happen." "The benefits to health care are obvious: finding cancer earlier and treating it more effectively, which reduces both the human and health care costs of this disease," said Dr. Martin Yaffe, CImTeC's Associate Centre Director, and Tory Family Chair in Cancer Research. "At the same time, we're helping to maximize the return on research investment, which will mean increased economic growth for Ontario and Canada." The Centre for Imaging Commercialization Technology works with researchers and SMEs in medical imaging and digital pathology to enable and accelerate translation of developments and innovations for commercial and clinical use. This will lead to improved understanding, diagnosis and treatment of disease. The Centre will provide researchers and SMEs with critically needed business expertise, technical capabilities, links to clinicians and infrastructure to assist them in becoming internationally competitive. CImTeC (www.cimtec-canada.ca) is funded by the Networks of Centres of Excellence (NCE) through its Centre of Excellence for Commercialization and Research (CECR) program. CImTeC is also supported by the OICR and hosted by Sunnybrook Research Institute in Toronto and Western University in London. Both OICR initiatives are co-led by Dr. Aaron Fenster and Dr. Martin Yaffe. Dr. Fenster is based at Robarts Research Institute in London, Ontario and Dr. Yaffe is based at Sunnybrook Research Institute in Toronto. Despite a great deal of progress in diagnosis and treatment, prostate cancer remains the third most common cause of cancer death in Canadian men. Current screening tools such as PSA tests do not provide an adequate characterization of the aggressiveness of the cancer and may result in overtreatment. Drs. Aaron Fenster and Glenn Bauman are leading an innovative project called SPIRIT (Smarter Prostate Imaging and Interventions) intended to reduce over-diagnosis of prostate cancer and reduce the morbidity of treatment. In its first year, the program will develop a suite of emerging imaging techniques to better distinguish aggressive vs. indolent cancer. It will then validate these techniques and test the most promising in prospective clinical trials, with a goal of developing new imaging approaches that have the potential to be rapidly and safely introduced in the clinic.